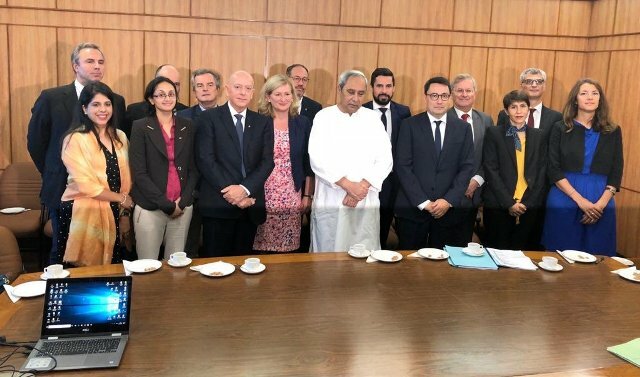 ONI Bureau: A French business delegation led by Alexandre Ziegler, Ambassador of France to India, on Saturday met Odisha Chief Minister Naveen Patnaik to explore investment opportunities in the state. The Chief Minister requested the French companies to invest in the state and participate in the second ‘Make in Odisha Conclave’ scheduled to be held in Bhubaneswar from November 11 to 15. “Honoured to meet CM of #Odisha, @Naveen_Odisha with a French business delegation. Thank you for an insightful conversation on how to increase our footprint in this fast growing state! #franceinindia,” the French Ambassador tweeted. The delegation said that since Odisha has the appropriate environment for financial investment, France will put in efforts to boost commercial ties with the state. France has expressed its intent to invest in the hotel, steel, electrical appliances, energy and other sectors, said a statement from the Chief Minister’s Office. Informing that Odisha has now become an attractive destination for investment, the Chief Minister said a socio-economic and commercial bond can be established between India and France with investments in Odisha. He said Odisha is the aluminium capital of South Asia accounting for over 54 per cent of the country’s production. “By producing 54% of aluminium in the country, Odisha has been termed as the aluminium capital of South Asia. Similarly, the country’s 25% steel is produced in Odisha. Thus, the state has earned fame as a steel hub,” said Patnaik. He said Odisha has its Vision-2030 for the development of downstream and ancillary industries in the metal sector. The state government will formulate a policy on defence and aerospace sectors soon, he added.